YOU GUYS! I have found the dress of my dreams. 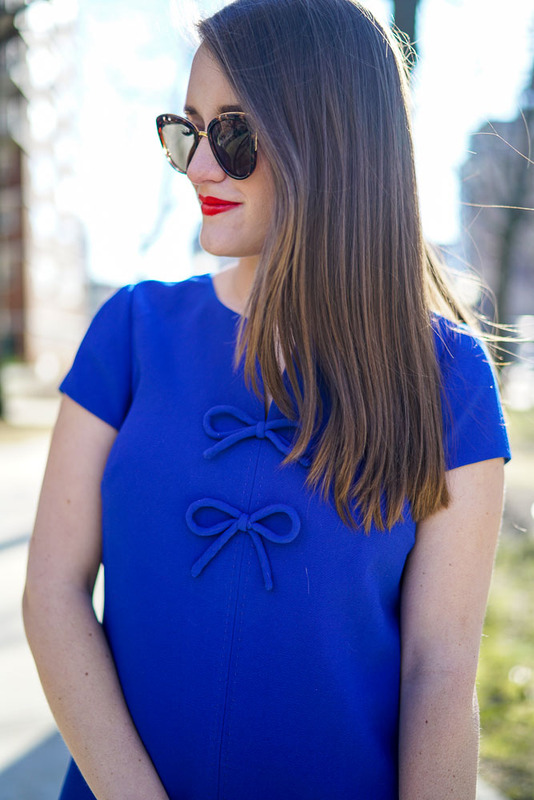 If you were like, "Krista, describe your perfect dress," I would say cobalt blue, either fit and flare or a flattering shift, simple and a lot of bows. Well the J. Crew gods heard my prayer and they were like, "OK WE'LL MAKE IT." Is this dress amazing, or what? Gah, I'm wearing it again today at work. It's just so perfect I can't handle it. It's perfect for work but also super flattering so I can wear it out as well. I saw it in the store last week when I was shopping and was like, "welp, that's mine now." 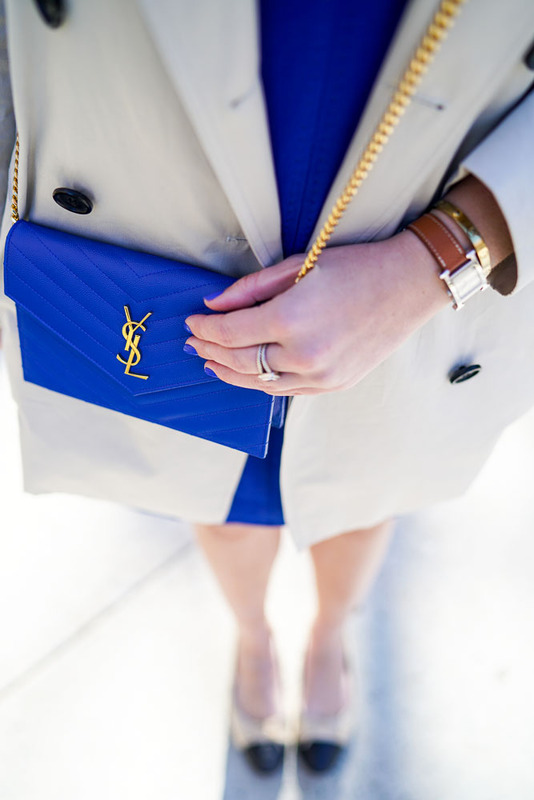 Of course I paired it with more classic pieces, like my new spring trench. I'm totally about classic over trendy recently (does that make me an adult?) and I'm loving it. Excited for more spring weather so I can wear this dress even more! But we're supposed to get more snow this weekend so I really don't know what to do with my life. Help! Yes, totally, this dress was made for you!!!! Such a cute dress- I love those bows! Love everything about the bag and the dress! So cute! This look is PERFECT for Spring. 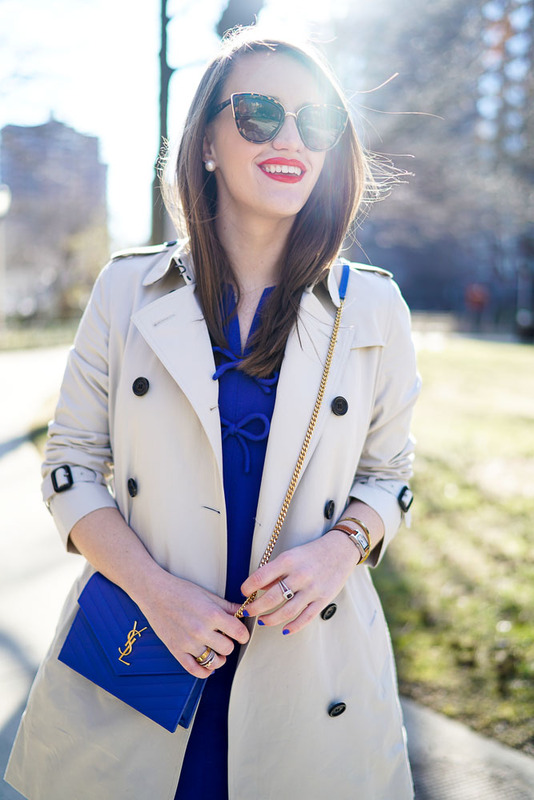 Love love love the cobalt and the trench! I think this blue is your color! Hey Krista, do you still have snap chat? Missing your snaps! You are seriously the cutest! I don't think I would have looked twice at this dress on the website, but seeing you style it is giving me heart eyes! I think I need it too! I am soooo obsessed with the blue, it looks so good on you!! The blue is just gorgeous!! I love the trench too - I'm working towards buying one for myself when I graduate from university (... cause ya know, adulting and stuff). You look stunning! love the dress! Great information! I appreciated your topic and writing style of content for guidance in a simple way. I like the style of your writing content mid length shearling coat for sale. It just amazing and excellent. The blog post is very connective and attractive. All the information I found in post is very useful.keep it up,you are doing great..